Two friends who are obsessed with cheese and wine transformed themselves into the Cheesewhizzes, the duo behind some of Napa's best parties. Here, their pairing ideas. Wine and cheese can be transcendent together—or a fermentation experiment gone awry. 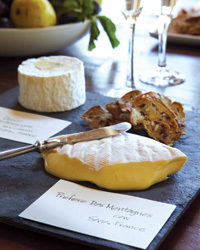 The tasting potlucks hosted by Napa Valley's Cheesewhizzes (a.k.a. Helen Jane Hearn and Natalie Wassum) give guests the chance to find their own sublime pairings. The two women pick a spectacular location, most often a winery—it is Napa, after all—then choose a theme (like cheese and wine from Piedmont, or Goudas from around the world with California reds). The guests do the rest, each bringing a bottle and a wedge to share. What began with 12 friends gathered around someone's dining-room table grew into parties with 85 guests. Cheesewhizzes has even gone national via cheesewhizzes.org, which encourages people to start their own tasting clubs. Helen Jane Hearn (l) and Natalie Wassum. Photo © James Baigrie. Even though they aren't wine or food experts—Hearn is a web designer, Wassum is in marketing—they share a love for themed parties and playing host. The role can have its challenges, though. "Once, a guest brought a Teleme, a soft and creamy cow's-milk cheese, that was so delicious, people got weird and started policing each other, saying 'You can't have any more of that'—and there was a whole table of other amazing cheeses," remembers Hearn. Not a bit of cheese is ever wasted, however. The leftovers go into plastic bags and, later in the week, Hearn and Wassum invite friends for a mac and cheese feast. 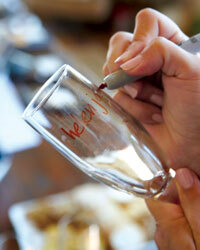 A recent Cheesewhizzes party took place at Outpost winery, way up on Howell Mountain. 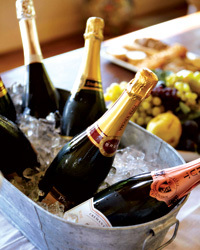 The theme was sparkling wine and cheese, a great match because the wine's bubbles are wonderful palate cleansers. As always, the hosts encouraged guests to find their own favorite pairings. "We originally tasted Toma Reale, a sheep's-milk Robiola, with Prosecco at our Piedmont party, and the match was a solid B," says Hearn. "But at the sparkling-wine event, we tried the supersmooth cheese with the equally smooth Schramsberg Brut, and it was the hit of the night." Then it was on to the next experiment.